Join today and get $15 off your first order from Candy Club! Do you have a sweet tooth that you just cannot seem to satisfy? Instead of spending countless amounts of money on sweets at the grocery store, Candy Club might be just what you are looking for. Candy Club is a snack box subscription service that sends a variety of chocolates and other candies directly to the doorstep of your home or office. Is Candy Club Worth My Subscription? Candy Club is a reliable snack box deal that consistently caters to the customer, always going above and beyond to put them first. Continue reading this Candy Club review to find out if this is an opportunity for you. Getting started with Candy Club is very simple and straight forward. First, simply visit candyclub.com, and you will be asked if you want to “get started” for yourself or if you would like to “give a gift.” As a token of appreciation for your business, Candy Club will also give you an additional $15 off of your first offer. With each plan, however, Candy Club requires the customer to pay the entire balance of their plan before beginning. The up-front cost for the 6-month plan comes out to $149.94, while the 12-month plan comes out to $263.88. Candy Club also charges customers for shipping and handling, which is $7.99 every month. Once you have committed to a subscription, Candy Club will guide you through a specially designed Candy Quiz. The Candy Quiz helps Candy Club cater to the types of candies that you like. It will help box curators find the best assortment of chocolates, candies, and other treats that meet the preferences of the customer. The Candy Quiz will not be available until you make your first initial payment on whichever plan you have selected. After the Candy Quiz has been completed, submitted, and reviewed, Candy Club will share their recommendations for your curated box with you. Candy Club makes it a point to do this every month, giving you the opportunity to decide if you like the box and if you would like to switch any items out. All plans will automatically renew at the end of the agreement, but they can be easily cancelled by emailing or calling Candy Club customer service. Call 888-598-5995 to reach a representative, or send a quick email to customerservice@candyclub.com if you have a question that is not urgent. The creators behind Candy Club also give you the opportunity to send your candy assortment box if you are not satisfied for a full refund. Simply contact customer service, tell them you were not pleased with their product, and they will take care of everything for you. Your subscription may be completely cancelled in the refund process, although. Not all candies are available to be shipped to certain zip codes due to temperature differences and melting candies. It's expensive! Candy Club also requires customers to pay the entire balance of their plan before beginning their subscription. Subscriptions automatically renew each month. BE SURE TO CALL CUSTOMER SERVICE AND CANCEL YOUR SUBSCRIPTION WHEN YOU NO LONGER WANT TO RECEIVE CANDY CLUB BOXES. Candy Club makes it a point to present their candy snack boxes in packaging that makes it stand out from many of their competitors. Your monthly Candy Club box will arrive right at the doorstep or your home or office in a large, nicely presented box. Open the box up, and you will find a piece of cardstock that outlines the premiere candies of the month. It also asks for your customer feedback on social media platforms such as Facebook, Twitter, and Instagram. Now onto the good part. The candy! The box is packed full of reusable, plastic containers that contain the different candies that Candy Club has either selected for you, or that you have already selected/adjusted. The plastic containers are insulated to retain the maximum amount of freshness of the candies. A few zip codes, however, cannot receive certain candies, such as chocolate, due to melting. Is Candy Club available outside the United States? After purchasing a Candy Club subscription, you will be asked to setup an account using your email address. You can access your account at any time by using your email address and your password. Once you log in, you will be directed to the Account & Orders section, and you will be able to edit your information. If you have any further questions, simply email Candy Club customer service. I don't like certain types of candy, what should I do? You can choose the candies that you receive after Candy Club presents you with their selection of treats based off of the Candy Quiz. You can also call Candy Club customer service, let them know you do not want a specific candy again, and they will be sure not to send you it again. When will my monthly box ship? For all orders, your box will ship in 1-3 business days after your place your order or select the candies for your box. Can I extend my recipients gift subscription? Because gift orders do not automatically renew, you will need to manually place a new order through the Candy Club website. What is the refer-a-friend program? How does it work? Candy Club lets members share their experiences and love of Candy Club with family members and friends. Using email or social media, you can send a refer-a-	friend referral link to any recipient you would like. Recipients who subscribe within a month of receiving the link will receive the first month of their subscription for free. The referring member will also receive their next month’s subscription box completely free of charge. Members can also receive up to 5 months of free candy for successfully referring 5 different people. Now that you have read this Candy Club review, you are probably trying to figure out if this is an opportunity that you are interested in or not. Candy Club is absolutely worth it for those of you who love trying new candy, but would like to eliminate the hassle of purchasing it at the store. Candy Club offers new, mouth-watering candies, chocolates, and other treats every single month. It is a reliable and consistent snack box deal that we are sure will not let you down! Now that you have read this Candy Club review, you now have all the necessary information to make a final decision for yourself. Visit candyclub.com if you would like to start subscribing today! Candy Club is perfect for your sweet tooth or your sweetheart. With a great variety of candy, responsive customer service, and simple ordering, it's quite the deal, though the price is more than some other boxes that ship the same type of products. Not happy with Candy Club at all- I cancelled my account, yet still got charged. I received the box, and they won’t even take it back. Total scam! We’re sorry to hear Candy Club was a disappointment. Unfortunately, Candy Club is under an autorenewal program, meaning you have to contact customer support in order for your subscription to stop and not be charged. It is possible that if the account was deleted without contacting customer support for cancellation, the subscription remained even though the account was deactivated. To contact Candy Club, email customerservice@candyclub.com and hopefully the issue will be solved. Thank you for letting us know about your experience, and have a great day! My mom got me a yearlong subscription for Christmas a few days ago… can’t wait to see what it does for my lifelong sweet tooth! I hope there’s a ton of sour candy. Does the website offer a menu or something of all the candy they offer? Or can I order specific kinds in each box? Thanks for commenting. 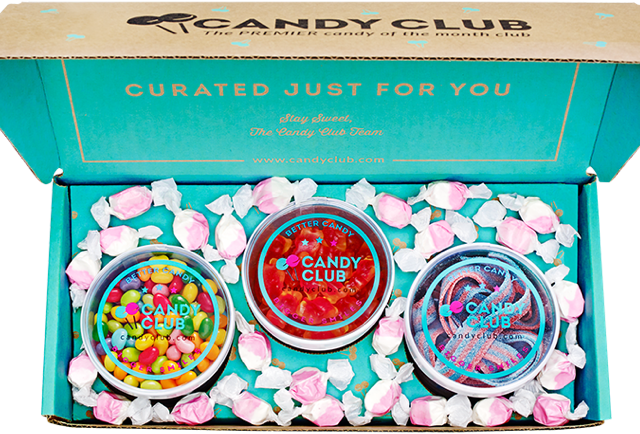 To answer your question, unfortunately, you cannot select specific candies to come in your CandyClub subscription box. However, you can answer a questionnaire about your preferences and sweet tooth tastes on the site. There is also a list of candies offered by CandyClub under the “candies” tab on the website. Hope this helps! I love the candies that Candy Club has to offer. I especially enjoyed the dummies and other sour chewable candies. Definitely worth my time. Definitely worth my money! Give Candy Club a try! !